If you’ve got an Apple iPad, then you’ve got access to NextBillion.net in full, clear, tablet vibrancy … for free. Thanks to our content partner, Ashoka Changemakers, NextBillion has been included in Flipboard, a quickly growing, personalize-able, e-magazine that pulls together sources and streams from numerous publications and blogs. As part of its partnership with Flipboard, Changemakers had the opportunity to select the content featured; and we’re glad to hear that NextBillion is among the media sources they chose. 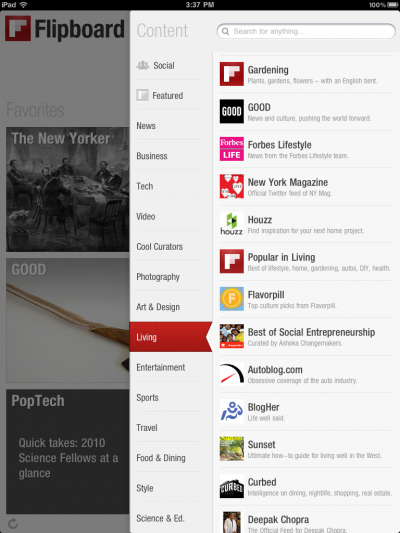 To get the free app, it’s as easy as going to Flipboard or search for it by name on the Apple App store. Once you do, click to the “Living Section” and scroll to find Ashoka listed among the contributors. 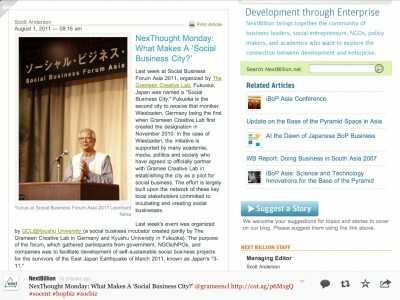 Click on ’Best of Social Entrepreneurship Curated by Ashoka Changemakers,’ and you’ll find regularly updated content from NextBillion as well as our full site, latest Tweets and everything else – all rendered on the iPad. While you’re there, you also can check out content from other social entrepreneurship sites, such as Care2, Dowser, and Echoing Green. We think it looks pretty nice and we hope our iPad readers do too. I don’t know if there are any immediate plans to offer Flipboard for iPhone/iPod Touch and/or for Android operating system tablets or smartphones. But if it happens, we’ll let you know about it.